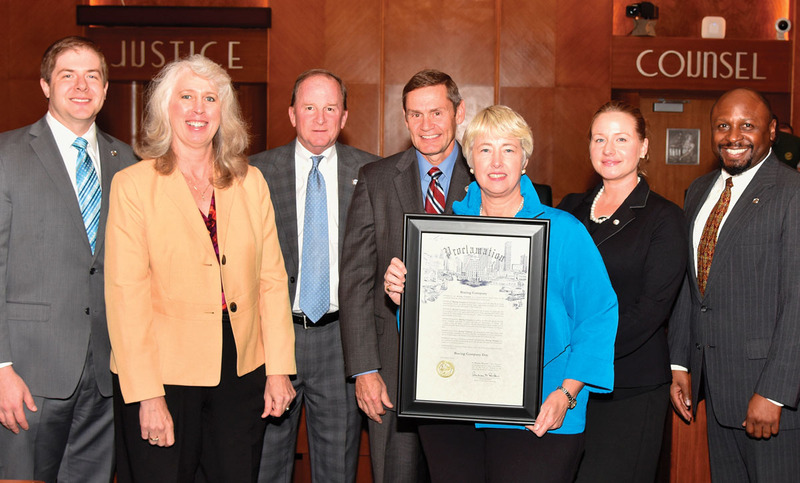 Boeing celebrates its centennial anniversary by receiving a proclamation from the city of Houston for contributions to the region’s economy. Pictured at the ceremony are, from left, Brian Freedman, Boeing State and Local Government Operations; Joy Bryant, Boeing Houston site leader; Houston City Councilman Dave Martin; Boeing Space Exploration Vice President and General Manager John Elbon; Houston Mayor Annise Parker; Darcie Durham, Boeing State and Local Government Operations; and Ken Ulmer, Boeing Space Exploration Communications. Boeing, which has been an integral part of the Bay Area community for many years, is celebrating its 100th anniversary this year. And, as Boeing points out, during the past 100 years, man has gone from walking on Earth to walking on the moon. From riding horses to flying jet airplanes. “With each decade, aviation technology crossed another frontier, and, with each crossing, the world changed,” the aerospace giant, that builds passenger airliners, military aircraft, space capsules and more, points out on its website. Not only has the company become a force in many fields, it has been part of a rich pioneering legacy in Texas for more than 70 years. Many will remember its days here as McDonnell Douglas. Today it has more than 4,300 employees in multiple locations in Texas – both commercial and defense customers in aerospace, electronic fabrications, aircraft maintenance and repair and much more. Boeing Space Exploration provides support services to NASA at the Johnson Space Center, is the prime contractor for the International Space Station and has been awarded a $4.2 billion contract to develop the next generation of spacecraft, as part of the Commercial Crew Program.